The communicator got inaugurated in Russia on March, 14 at the press-conference devoted to arrival of three new models in this local market. To avoid possible confusion, we will sharply define the codename we will use throughout this review. Following the tradition of HTC, the communicator was bearing a codename back when it was still in development. 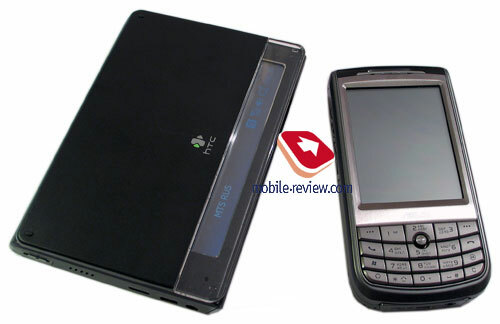 Thus before 3GSM Congress 2007 it had been known mainly as HTC Athena. It is really interesting to figure out whether this codename is based on something more credible than a good-sounding word? If we turn our sight to mythology, where the Taiwanese developers frequently get codenames from, Athena is the goddess of wisdom and just war. 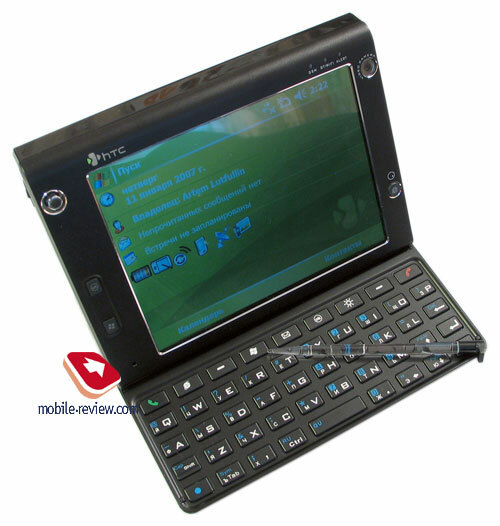 In the case of HTC Athena such interpretation fits it like a glove, as the manufacturer comes up with a cutting edge device with a bevy of functions housed in huge metal casing. Released for the rest of the world as HTC Advantage, with its name the communicator clearly gives everyone to understand that it packs great functionality and other technical innovations under the hood. 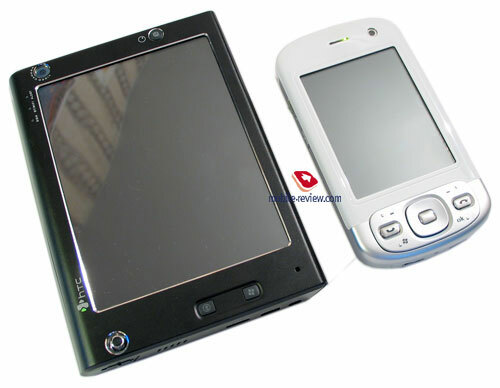 Ultimately, the device is featured under HTC Advantage or HTC X7500 titles today. Or they use both. We will risk supposing that the numeric index is here to stay for sure, and as for Athena and Advantage, today the communicator is more likely to be known under the latter name. The numeric index steps into the shade, used for identifying the platform. This platform will also serves as the base for Dopod U1000, next on the list is a carrier-branded T-Mobile Ameo. 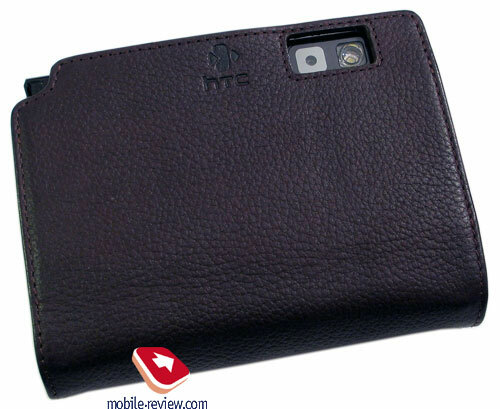 This review features HTC X7500 index alone. Positioning of the communicator is one of the cruxes that users and expert have been wondering about all this If you remember, some time ago we made some guesses on the future this model had before it. 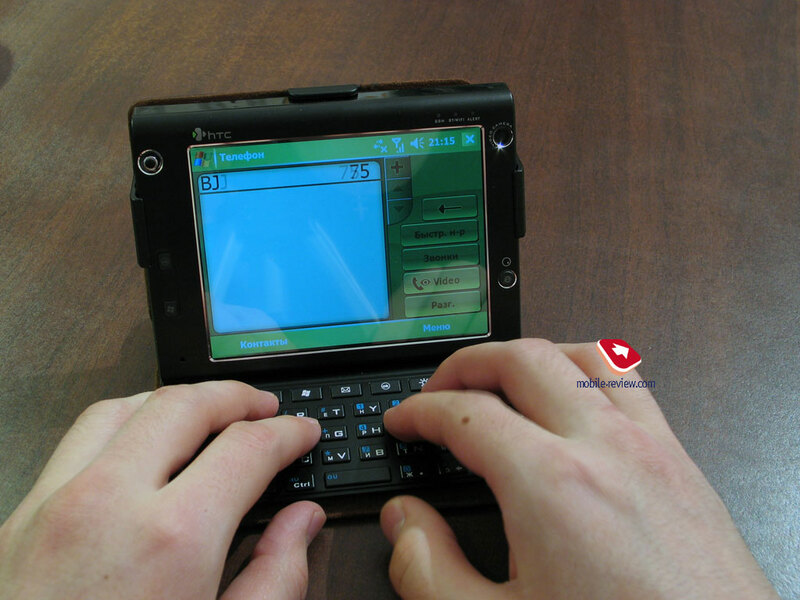 You can learn more about that in an article by Anton Kotov - HTC Athena – the realm of UMPC. In this review we are looking closer at the communicator’s potential and the technological talents characterizing devices like this. The device’s casing retains the shapes of a candy-bar with major part made of metal. I shall share with you an observation of mine that corroborates usage of metal as the main material. Aside from weight, that also implies the material type, the feeling you get on a frosty day makes it all clear. With some degrees below zero, even when carried in a bag, the casing gets very chilly, to the extent when it becomes uncomfortable to hold the device in hands for some time. Plastic would barely lend it such ability. Under HTC’s brand the communicator will come in black, with T-Mobile Ameo will employ light-grey casing. From our point of view, black finishing seems more appropriate in this very case. A communicator this big and feature-packed painted in black naturally looks staid and austere, while white color scheme feels somewhat unsophisticated and doesn’t fit in the device’s image. Almost the entire fascia’s real estate is taken by the display, which is a 5-inch screen with VGA resolution – we will say some words about it as we dig deeper into the review. In the top left corner sits the joystick, using which you can navigate through the menu and launch applications. The joystick’s coating is made of soft, albeit slightly rubberized material, which doesn’t let your finger slip, the joystick moves with ease, perhaps easier than we hoped it would. This causes strange feelings, as holding a device marginally short of 500 grams in weight, the finger on the joystick automatically expects to hitch and get proper feedback on every press, but nothing like this actually happens. Anyhow softness of the joystick is something requiring getting used to, as it will seem to you far too easy to move. Further down, to the left of the display, sit two keys – the one on the top calls up Start menu, while the bottom one acts as OK or brings you back to the Today screen. But buttons are nothing new on HTC-branded communicators. 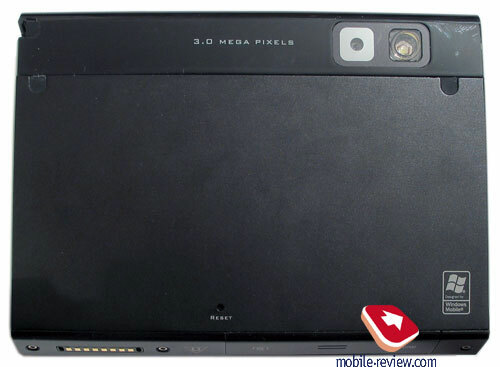 The right side holds a lens of forward-facing VGA camera for videoconferencing and taking stills. Next to the camera are three LIEDS, that stand for the following (from left to right): GSM – indicates GSM-module activity (green) and GPS (red). BT/WiFi – shows status of Bluetooth (blue) and Wi-Fi (green), of flashes with either of the colors in case they are both activated. Alert – displays various events (messages, missed calls) and notifies you when the battery is low or it is being recharged (red). The casing’s bottom to the right of the display plays host to dedicated VueFLO key – read further to find out what this feature is. Now on to the left-hand side, where the volume slider, loudspeaker and a couple of sockets are situated. 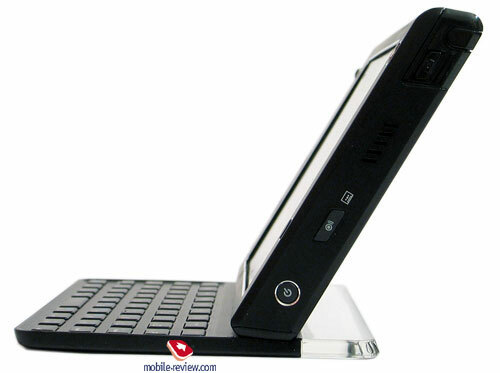 The device makes use of stereo-speakers that are symmetrically located on both spines of the X7500. Though the very term “stereo” can be hardly applied to a communicator’s abilities, the volume of these speakers proves to be exceedingly high. 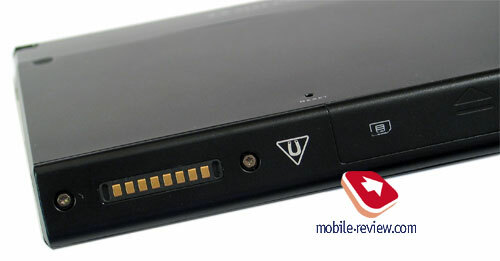 In this sense the X7500 outdoes even HTC P3600 (Trinity), whose overall volume level is very high in the first place. But unlike Trinity, at full blast the X7500’s loudspeakers don’t start creaking. Apart from the standard ExtUSB slot, used for charging and plugging in data cable, in HTC X7500 you will also find two extra sockets. These are VGA-Out for transferring image you’re your TV’s screen and 3,5 mm audio jack for plugging in custom headphones or headset. The latter slot seemingly should become a real milestone in the history of HTC’s devices development. In case the company won’t give up on it in the impending offerings, of course. The default headset also comes with 3,5 mm plug. The X7500 supports USB-Host feature at USB 1.1 speed – VGA-Out socket with a special cable plugged in serves for these purposes. We will put this function through its paces a bit later, when this accessory becomes available. For transferring data and synchronization with PC the X7500 makes use of ExtUSB with USB 2.0 enabled. 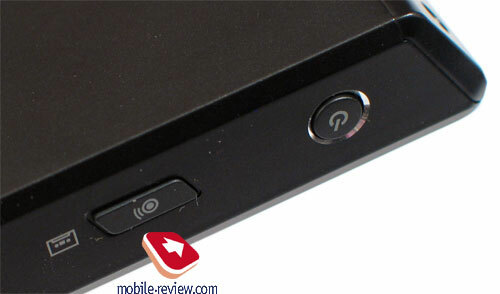 The right spin holds camera shortcut key, dedicated button for bringing up fast menu of wireless connectivity options and power button doubling as hibernate key as well. Much like the left spine, here you will spot another speaker. All buttons slightly stick out of the casing’s surface, which makes using them a tad fiddly, since feedback is quite week and this doesn’t let you tell whether the button was pressed or not. Again, we should say that when holding such massive and heavyweight device, you normally expect its keys to provide more adequate feedback and sizes that wouldn’t look miserable compared to the X7500’s dimensions. The top left corner of the right spine has the stylus silo, with the stylus placed horizontally in the top part of the device. 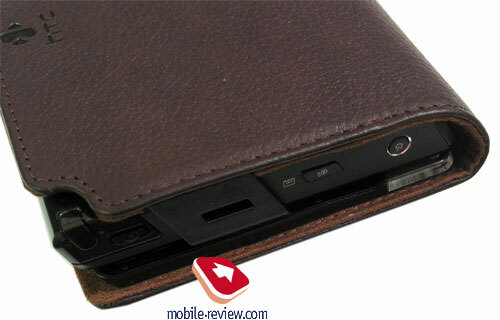 The stylus firmly sits in the slot. 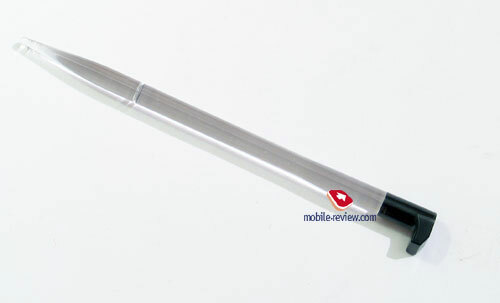 Its tip has a special dent, just as the casing does, which allows drawing the stylus without any problems. The stylus is a standout thanks to the quirk looks and unusual material used – it is made of transparent plastic and at that quite flexible. While it is pretty short, its thickness is something to reckon with. Looks aside, it is very easy and pleasant to use, getting used to it won’t take more than 1-2 hours. Flipping over to the communicator’s back side, you will find a lens of the main 3 Mpix camera, LED flash and soft reset button, as well as two sockets located on the edges of the panel’s top part and covered by rubber stubs. One of them serves for plugging in an external antenna, while the other one – for connecting an external GPS antenna. What the X7500’s camera can do – this is what we are going to talk about in the next installment of the review. On the bottom rim you will find a socket covered by a flap and a set of copper plates. The flap is linked up to the casing and should be slid towards the back panel if you want to open it. 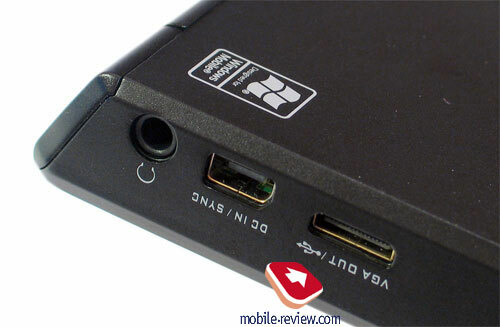 Inside the socket are three slots – miniSD memory expansion slot, SIM-card bed and battery. Now we are going to dwell upon each of these in particular. 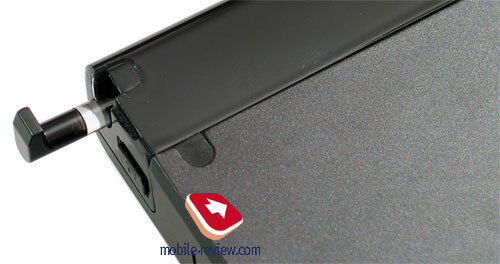 The memory card is inserted into a standard slot, to extract it you just need to pull it. 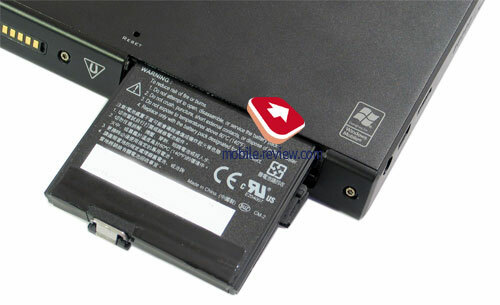 The battery is also housed in a slot, but at that utilizes a special mounting. 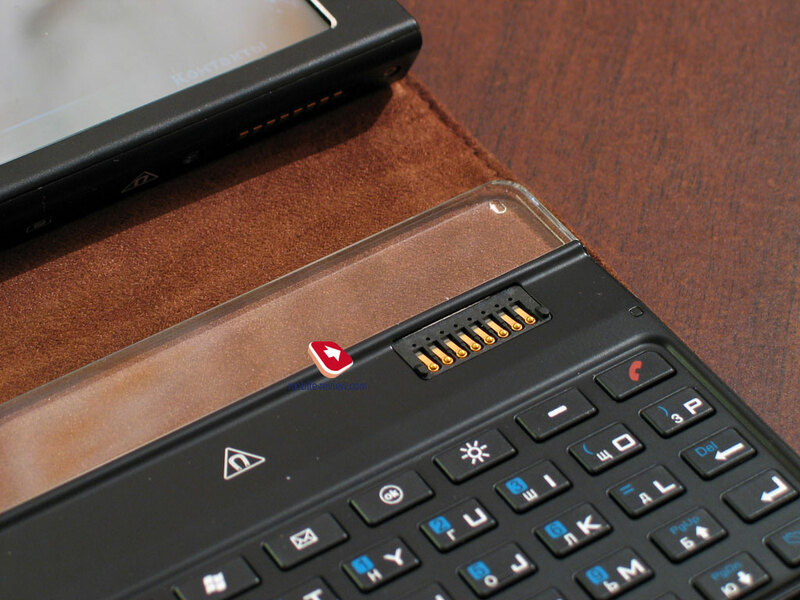 There is a tiny pin on the battery itself that goes down into the special socket when the battery slides into its slot, and thus locks it there. 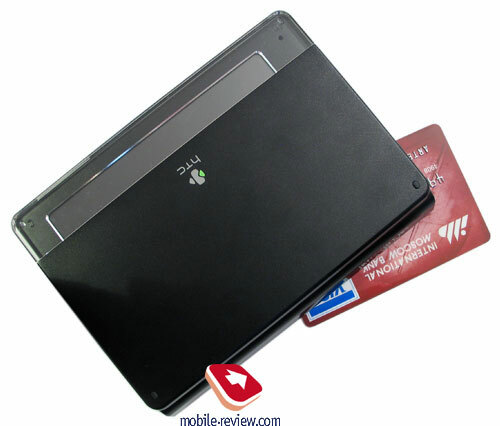 Though, the slot for SIM-card is the most out of the ordinary thing among these – the card is plugged in a small socket covered by a flap made of white plastic. 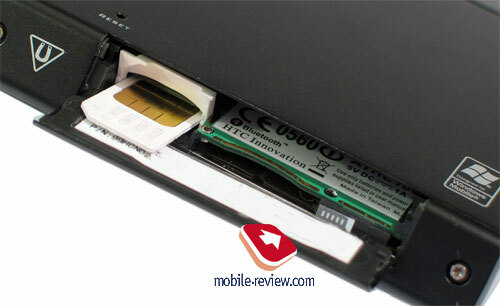 To plug a SIM-card in or take it out, you should lift the cover first and then insert the card. Extracting it is done pretty much in the same fashion, but in this case you should hook the card with a nail. As a result the process of swapping SIM-cards gets to be a very exciting, challenging, you name it, task. We strongly recommend that you keep all magnetic carriers on a safe distance (at least 5 cm) from this device or its keyboard. If you carry a wallet or a purse with plastic cards in it with the device or its keyboard, then the information stored on these cards might be wiped. The magnet is placed both at the bottom of the casing and on the keyboard. A few words about usage of the communicator linked up with the keyboard. 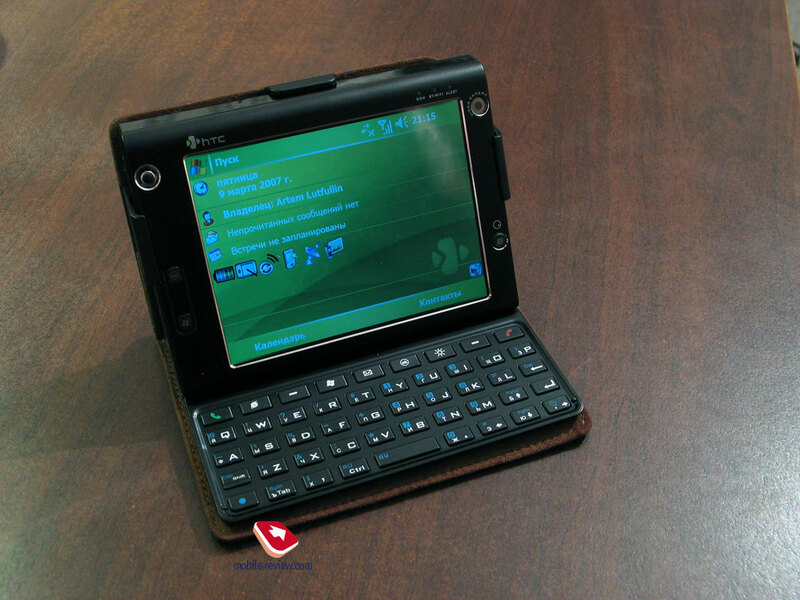 We can rightfully say, without being afraid of overcomplicating things, that the implementation of QWERTY-keyboard in HTC X7500’s case is more than original. 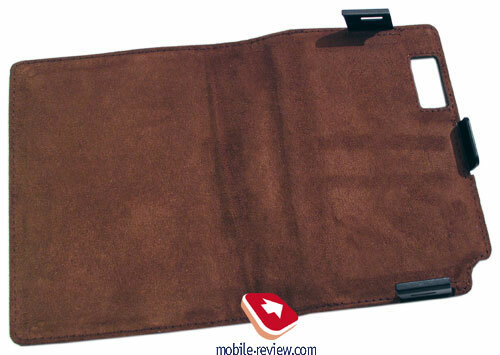 The magnetic mounting, of course, has its own drawbacks, such as the ability to erase data from magnetic carriers, but for the rest it is quite comfortable to use. 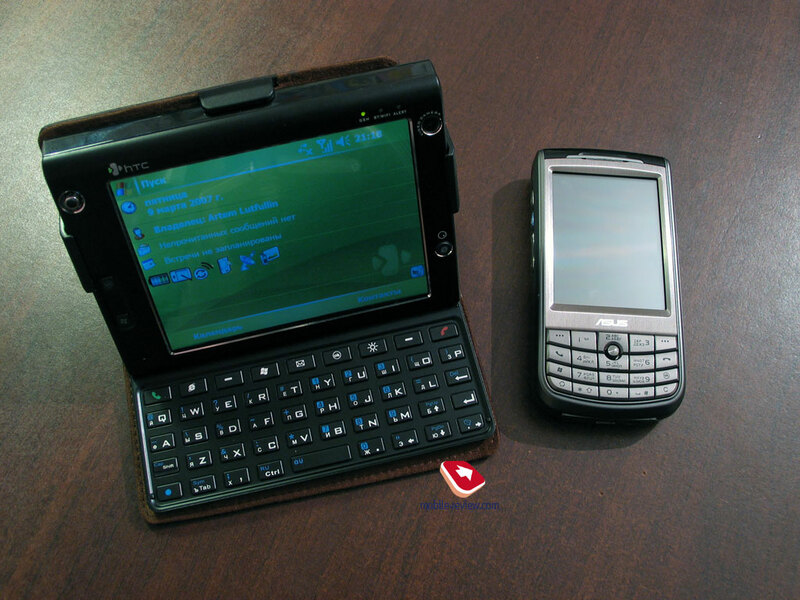 For starters, the keyboard is not linked up with the device, and sometime you may just leave it at home, for example when you are going to use it as a GPS-navigator, the thumbboard will be more of a burden. The keyboard itself is a think metal plate with well-spaced moderately sized keys, and this is its most crucial letdown. These buttons are not only small, they only marginally stick out of the casing, and whereas the side-mounted keys are more or less adequate, since you won’t need them too often, for a thumbboard this shortcoming is the first thing you stumble upon. 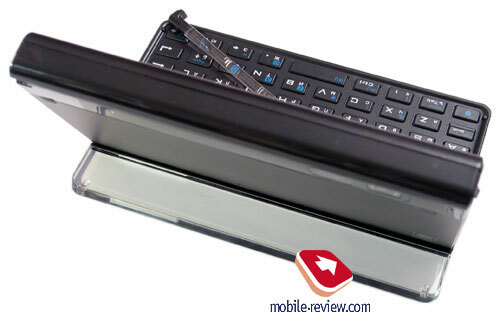 In fact key presses give almost no feedback or “click” sound, therefore you feel like handling a virtual keyboard. Getting used to this drawback is very hard, even next to impossible. Ultimately, you will have to just accept that the buttons are very sensitive and don’t provide any feedback. 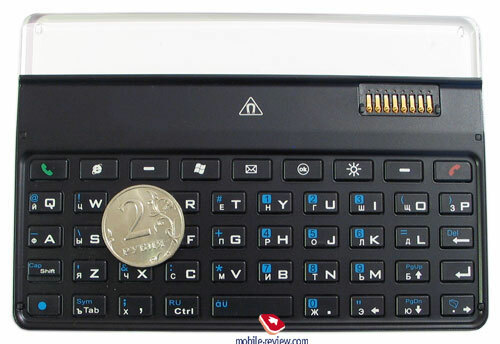 It’s hard to tell why the thumbboard coming included with the X7500 is so mediocre, especially in light of the fact that a communicator paired up with a QWERTY-keyboard does well when it comes to typing texts. Maybe, the successor to HTC X7500 will get rid of this letdown, which will be a great plus for it. 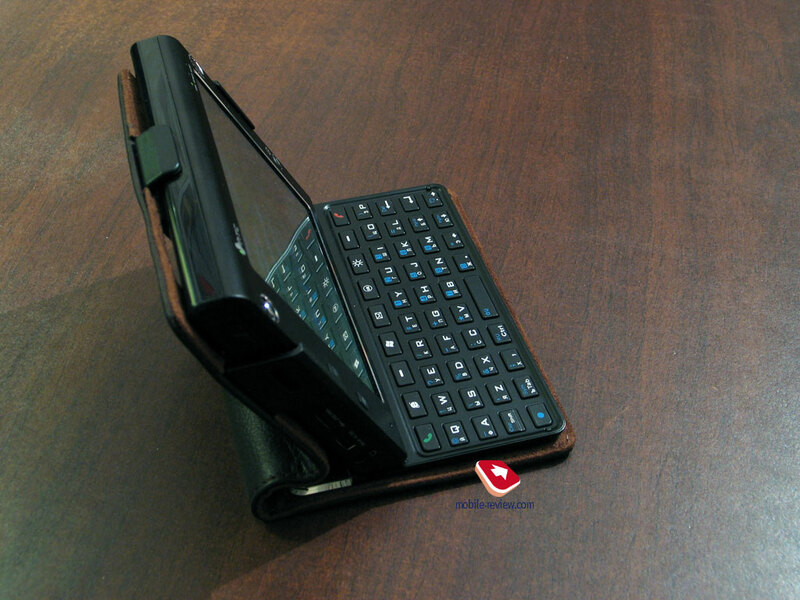 The power of the magnet here is so great that you can continue typing even when the X7500 is suspended, at that the communicator’s casing won’t lean on either side. 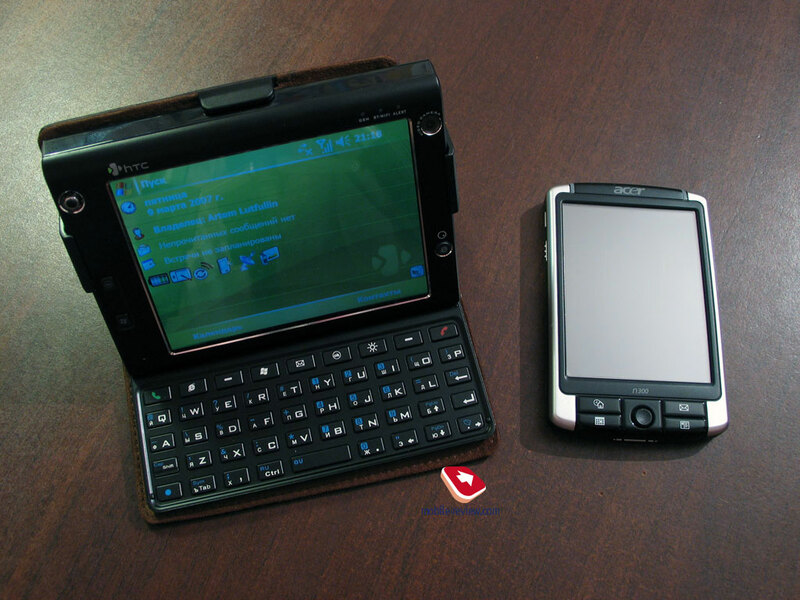 When placed on a table, the device allows for the same style of text input as a notebook, if only it lacked the issue with the keyboard. 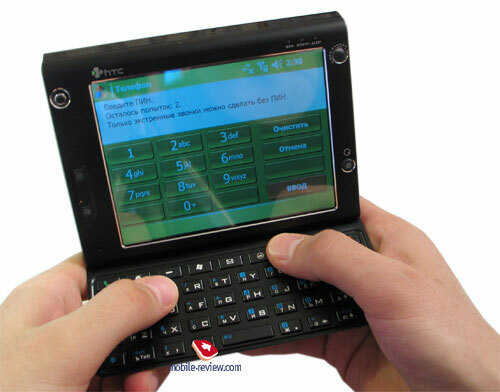 The layout of cyrillic symbols is similar to that found on the previous HTC-branded QWERTY-armed communicators: HTC TyTN, HTC Herald (P3450). Placement of some symbols is different from the standard layout found on full-size keyboards. Though mastering it won’t take much time (2-3 days at worst), especially when you handle texts or reply to e-mails, type SMS messages often. HTC VueFLO™ motion sensor is one more godsend of the company. This technology has a great potential however it’s used in HTC X7500 in a very limited fashion. In the model motion sensor is responsible for only two options. The first is parking hard disk pins when the device falls down, and the second – work in the browser. In practice it works in the following way. You launch the browser with VueFLO function activated. At start up the sensor memorizes the device’s location. Leaning the communicator aside from the initial position screen-down (with the casing’s upper part headed toward you) you scroll down the page in the browser. Leaning the communicator screen-up (with the casing’s upper part headed away from you) – the page is scrolled up. The same thing goes for with horizontal scrolling. On top of that the sensor reacts to how fast you move the device. Should you move the device abruptly the page will be scrolled at maximum speed, while doing this slowly you will get smooth scrolling. It is really difficult to say in one word or in a laconic sentence what a breeze work with the function is. In fact it is a new type of device management implemented in communicators. Use of a motion sensor for handling some apps or even the parts of system interface will be a new milestone in the creation of device management systems. In the X7500 VueFLO is responsible for activity of the sensor in browser, Internet Explorer and Opera Mobile, which is an extra pre-installed application. In reality this function can be applied at least in a few more areas. For example, while reading a book, leaning the device up and downwill be the handiest way of looking through the pages. As for the games, the sensor can be used as an additional type of control, at that in different genres it will see different fields of applications: from turns and speed-ups in arcade races to scrolling the map in strategy and looking through “skills” in RPG. In future this idea is expected to be developed not only in HTC-branded devices but in those by other manufacturers. Sooner or later this type of device management will find its own niche in the market. The case in the X7500’s sales package plays quite a significant role. 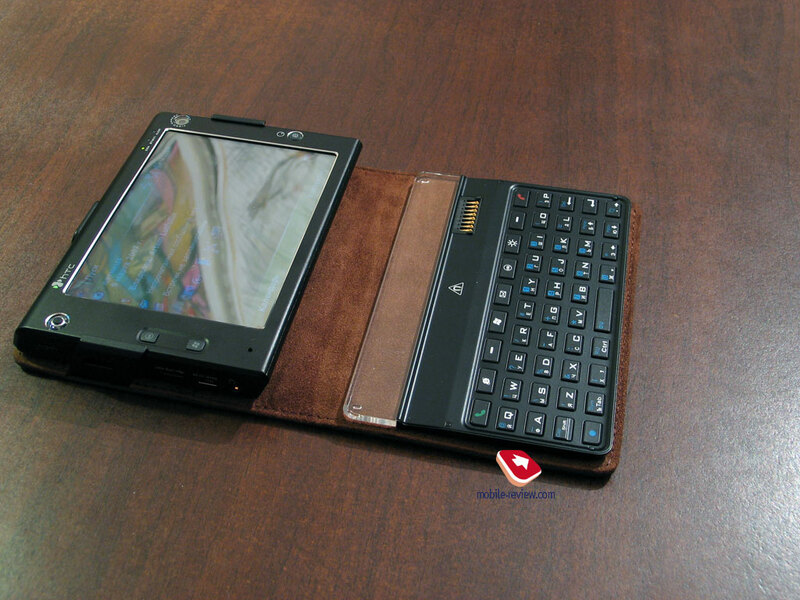 It is sufficient to say that if there was no case in the standard package, it would be considerably less comfortable to carry the device, although in terms of this aspect even with the leather case the X7500 can not be regarded as ideal or convenient to drag along. 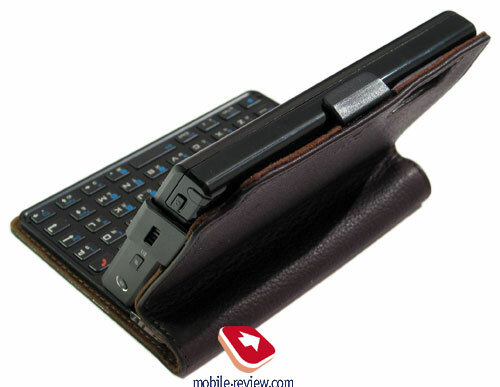 The case is designed as a wide leather stripe with mountings on one of the sides. 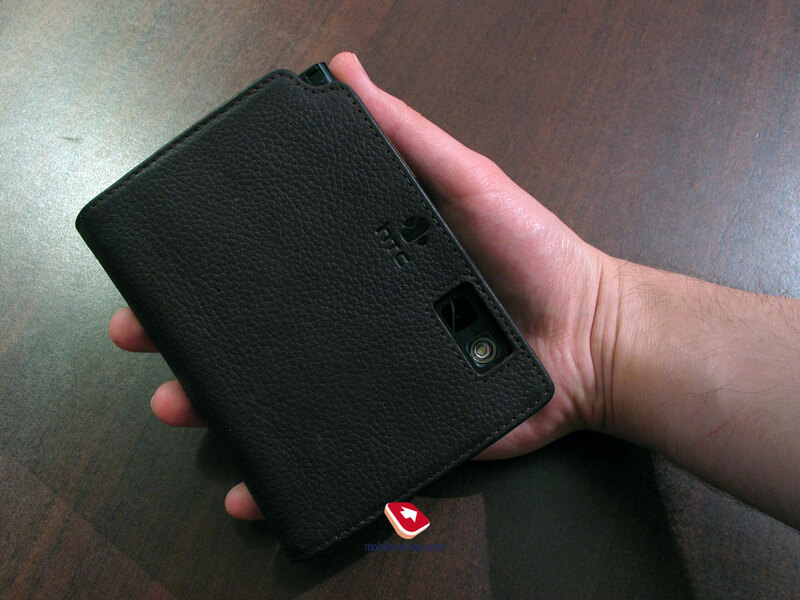 The case shell itself is made of hardened plastic with leather being used only on the surface. One part of the case plays host to a magnet. Here is the way it works. On one half we put the QWERTY-keyboard, using the magnets on the keyboard, so that is firmly sits on the case. In the slots on the other half of the case we insert the communicator’s casing. The mount here is very reliable. 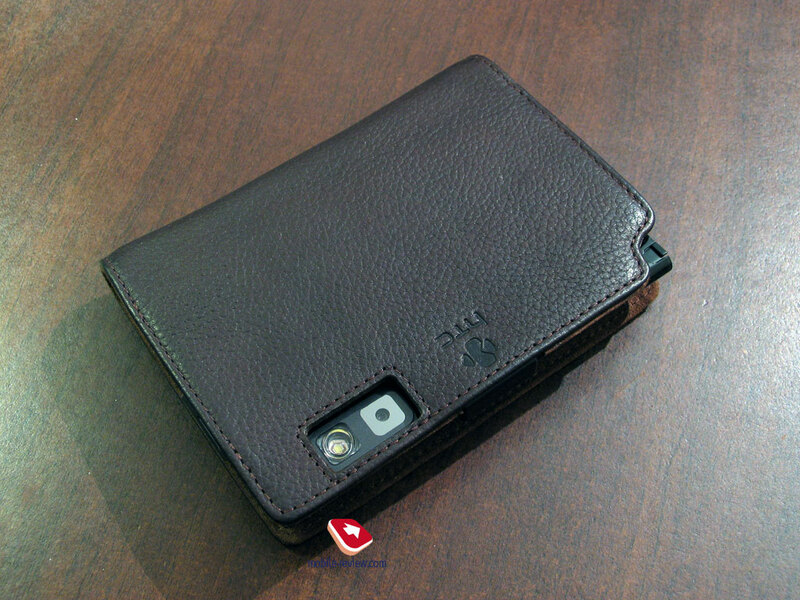 In the end we get a candy-bar in closed state in the leather case. Of course, this increases the device’s size. 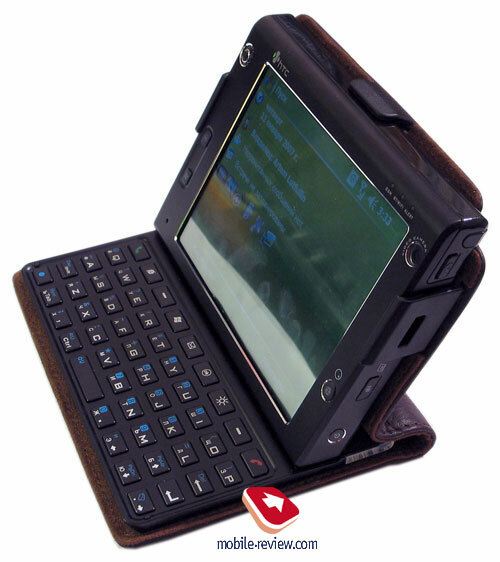 When closed, the keyboard covers the entire display, making the device look quite familiar: QWERTY is placed horizontally and casing is a bit inclined. It is actually the first time when a communicator sports a display with 5” diagonal (100,5x75 mm). 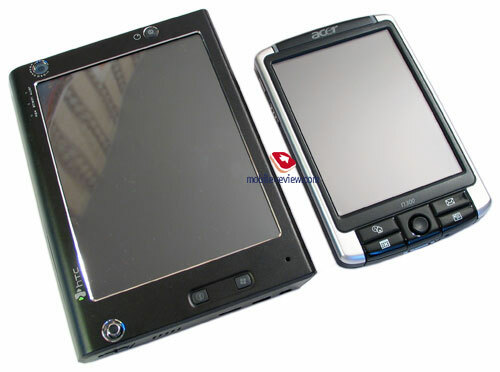 Specifications are standard for the modern devices, particularly these is TFT-matrix with VGA resolution (640x480 pixels). The display shows up to 65 K colors, the OS software restriction has its impact on it. The maximum level of display’s brightness is extremely high, taking into account the large diagonal your eyes just start getting tired of such superfluous brightness. Horizontal viewing angles are quite good, as for the vertical one, they are a bit worse. The image gets distorted only at extreme inclination angles. On various forums and sites you may find information exclusively from the “eye-witnesses” that the display has a serious drawback – grainy picture. People who are writing this first of all refer to the diagonal/resolution ratio. Now we can assert that these were nothing but personal thoughts and hearsays. The picture on the display is no grainier than we have come to expect from it, in this regard the device is in line with any other model sporting such resolution. To switch brightness you should use the slider key. On a sunny day the display does well, thanks to high brightness the picture gets insignificantly washed out and large diagonal makes for easy reading of the information shown on the screen. Minimal backlighting level is sufficient to make some use of the communicator in the dark. We may state that the manufacturer has succeeded in shifting to new diagonal without losing in quality. Presence of an “external” screen is one of communicator’s specific features. In fact it is a small area on the display showing service information. It is located in the lower part of the screen which turns into the additional display when the screen is covered with the thumbboard. Here you will find the indicators of battery charge level, signal strength, missed calls or messages, reminders, meetings. 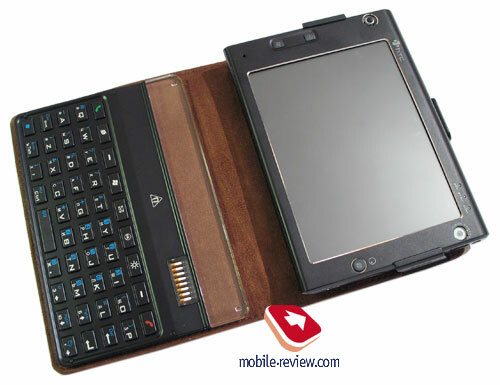 The device utilizes a 2200 mAh Li-Ion detachable battery. The battery life averages 2-3 days at 30 minutes of calls and 20 messages. The results of lifetime test will be disclosed in the second part of the review. The device carries a 3 Mpix camera with autofocus onboard. It is the first device by HTC that takes advantage of autofocus and 3 Mpix resolution. 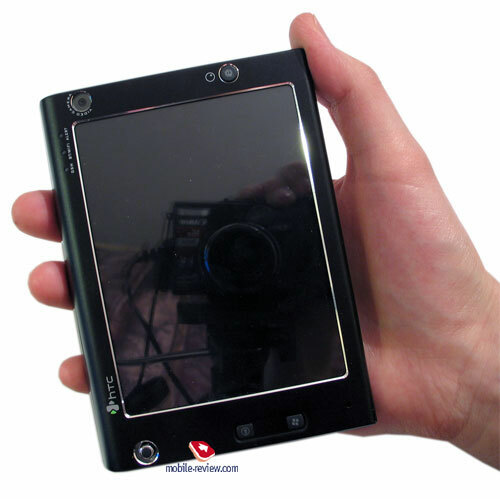 We decided to review camera rather thoroughly, for this purpose we compared snaps made in different environments on such devices as HTC X7500, Sony Ericsson K790, Nokia N73, Canon PowerShot A510. The digital camera is in only to set the quality bar. Look forward to the comparative review of cameras in the second part that is to come at the end of this week. 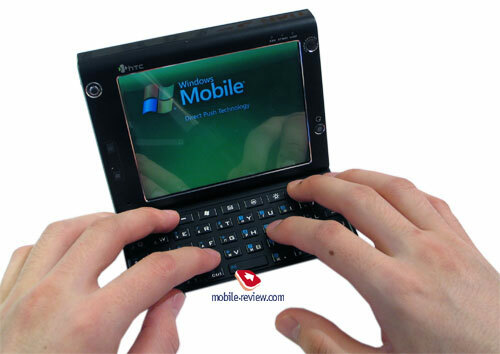 The device is powered by XScale PXA270 624 MHz CPU, that has stood the test of time,with ATi™ Graphic Chip W2284. Such chip is used not only for processing video and graphics, but also for handling the camera. Particularly, calculating autofocus algorithms and settings of automatic white balance are done with the help of this graphic subsystem. RAM volume is 128 Mb, as for Flash-memory, there is 258 Mb of it with part of it being user-manageable, which can be used for storing personal data and user settings. The built-in memory can be expanded with MicroSD cards, although with 8 Gb hard drive onboard it won’t be so vital. The communicator’s RAM is sufficient to carry out all tasks you can think of. The X7500 makes use of a hard drive by Hitachi – 8Gb Hitachi Microdrive. To prevent data loss and possible damage, G-shock system and motion sensor (for parking the pins when the device falls down) are used. We will look into the device’s speed in the comparative part of our review along with the review of cameras. The communicator works in UMTS and GSM networks (850/900/1800/1900), for both high speed data technologies are supported, HSDPA and EDGE respectively. Qualcomm MSM 6275 chip is responsible for the handling of phone department of the device. This model lacks an Infrared port. The company step by step decreases number the devices with such connectivity option onboard, although, just like many other makers, it hasn’t completely cut it off to date. In some of the upcoming models we will still see Infrared connectivity. 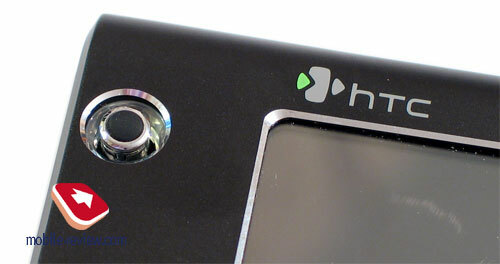 The interface slot ExtUSB is standard for HTC. For headset and headphones the X7500 makes use of a stand-alone 3.5 mm audio jack. The fact that the company has made that logical step in this area and armed the device with a standard socket really makes us cheer. We should just hope that in future this idea will be developed even further, so charging and synchronization would be the only functions ExtUSB could do. The device carries Bluetooth 2.0 module onboard. The EDR support is not provided. The list of supported Bluetooth profiles is quite standard; we’ve often met it in other communicators by HTC. Wi-Fi 802.11b/g. Here we could repeat again everything what was said about other HTC’s models. Everything works like a well-oiled machine; setting up Wi-Fi is everything but a hassle. 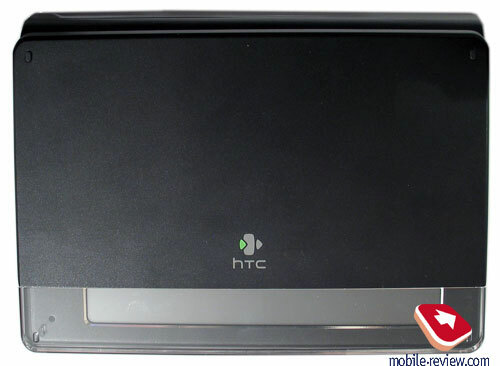 No new features and differences from other HTC models were found in this device. When testing the device, standard method was used: the row of calls in Skype network was carried out, it delivered no problems. 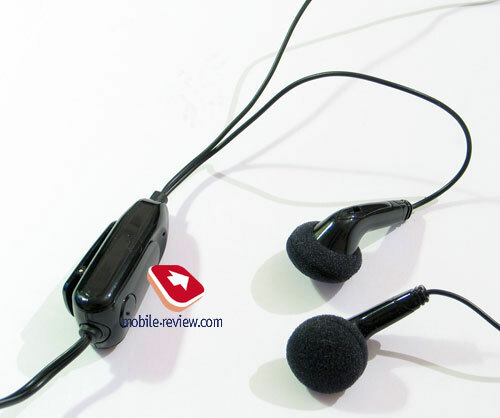 The 3.5 slot used in the X7500 finally gives you the chance to use communicator in pair with any headphones. The headset you get out of the box is armed with a 3.5 mm jack. The headset wire has a rather bulky block on it, where mechanical volume slider and call receive/reject keys are placed. The block can be put on your clothing with the help of a clip. But there is another thing of note. The headset wire is not long, so should you put the device in a bag it will barely prove to be enough. Keeping in mind that the headphones are asymmetrical (one of them should be put around the neck) the length won’t be sufficient at all, which is a major letdown for the X7500 on the while, since it is the headset that will be the main accessory for usage of the communicator as a phone. Basically, it is just uncomfortable to talk via the X7500 holding it hands, then it well seem rather queer to keep the casing which makes up 1,5 man’s palm in size and weights 400 g, near your ear. The best solution of the problem is to put the device in the pocket of outerwear or use Bluetooth headset instead of a wired one. The sound quality was tested with in-ear headphones (Sennheiser MXL-51) and closed-type headphones (Sennheiser HD-212 Pro). The X7500 sounded pretty clear, albeit too dull and unsophisticated. The equalizer settings can solve this problem as you can always put one or a couple of sounding aspects into the limelight. But this will not change the whole picture. The device can well be used as a music player if you are not so too keen on sonic experience you get. And this is where the first part of the review comes to an end. In the second installment we will look into the communicator’s performance, battery life as well as to additional software and camera quality. I’d like to mention that having released the X7500 the company made a considerable step forward, in the sense of additional software and built-in camera. 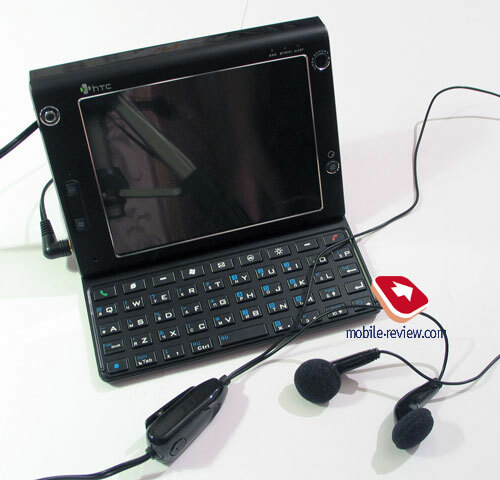 By this we mean a more logical approach to the selection of preinstalled apps and the first built in camera by HTC, whose snaps doesn’t hopelessly lag behind, compared to the market’s best solutions in this area, Sony Ericsson K790 and Nokia N73.